Skybet have a promotion that runs every week from Monday to Sunday whereby you bet £25 and receive a £5 free bet. This offer is very quick and easy to do, and it should definitely be part of your weekly matched betting routine. All events and markets eligible. Opt In required. You can combine this offer with other Skybet offers to minimise losses. 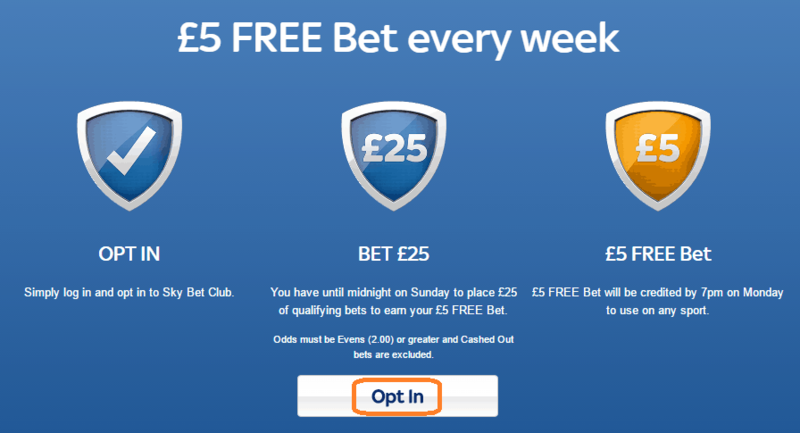 To trigger the £5 free bet, you must place bets totalling £25 or more at odds of 2.0+. Open up Skybet and your exchange and find a close match between the back and lay odds for any event and any market. 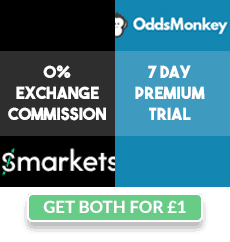 Alternatively you can use Oddsmonkey's Oddsmatcher and filter out Skybet. Instead of looking for a match you can combine this offer with other Skybet offers, so long as bets are placed and settled between 00:01 Mon - 23:59 Sun. After your bets have settled you will receive a £5 free bet that can be used on anything. I suggest betting on a team or horse with high odds (4.0+) to convert this to £3-£4 profit. You can repeat this offer weekly. Skybet are a good bookmaker so try not to take obscure matches - bet on popular events. Free bets expire the following Sunday at 23:59. Skybet have great reloads such as a weekly price boost and weekend horse racing refunds. Try to combine this with one of those offers. Try to lose no more than £2 on trigger bets so that this offer is still profitable (or at least keeping your losses for other promotions low).